گلشاهی, حکیم, قادر, سرمد. (1396). حل عددی معادلات آب کم‌عمق دو لایه بر حسب متغیرهای فشارورد و کژفشار با استفاده از روش فشرده مرتبه چهارم. 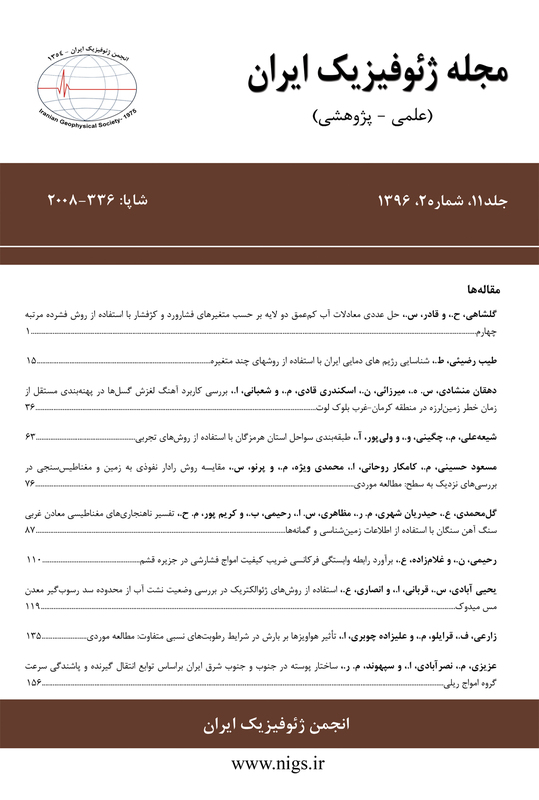 مجله ژئوفیزیک ایران, 11(2), 1-14. حکیم گلشاهی; سرمد قادر. "حل عددی معادلات آب کم‌عمق دو لایه بر حسب متغیرهای فشارورد و کژفشار با استفاده از روش فشرده مرتبه چهارم". مجله ژئوفیزیک ایران, 11, 2, 1396, 1-14. گلشاهی, حکیم, قادر, سرمد. (1396). 'حل عددی معادلات آب کم‌عمق دو لایه بر حسب متغیرهای فشارورد و کژفشار با استفاده از روش فشرده مرتبه چهارم', مجله ژئوفیزیک ایران, 11(2), pp. 1-14. گلشاهی, حکیم, قادر, سرمد. حل عددی معادلات آب کم‌عمق دو لایه بر حسب متغیرهای فشارورد و کژفشار با استفاده از روش فشرده مرتبه چهارم. مجله ژئوفیزیک ایران, 1396; 11(2): 1-14. در پژوهش حاضر، روش فشرده مرتبه چهارم برای حل عددی معادلات آب کم‌عمق دولایه در صفحه f برحسب متغیرهای تاوایی، واگرایی و ارتفاع به‌کار گرفته می‌شود. با درنظر گرفتن متغیرهای فشارورد و کژفشار، این معادلات به دو بخش فشاورد و کژفشار تقسیم می‌شوند، به‌گونه‌ای که هر بخش به‌طور مجزا حل می‌شود. برای گسسته‌سازی مکانی معادلات، علاوه بر روش فشرده مرتبه چهارم از روش مرتبه دوم مرکزی نیز استفاده شده است تا نتایج این دو روش با یکدیگر مقایسه شوند. برای فرمول‌بندی و گسسته‌سازی زمانی این معادلات، روش نیمه‌ضمنی سه‌ترازه به‌کار گرفته شده است. شرط اولیه کژفشار به‌گونه‌ای انتخاب شده است که میدان جریان در لایه بالایی درست درخلاف جهت جریان لایه پایینی است و متغیرهای فشارورد در لحظه اولیه، صفر هستند. نتایج نشان‌دهنده قابلیت مدل در برقراری پایستگی انرژی و جرم است. مقایسه نتایج، عملکرد بهتر روش فشرده مرتبه چهارم را در مقایسه با روش مرتبه دوم مرکزی نشان می‌دهد. Two-dimensional shallow water equations are commonly used to study the dynamics of large-scale flows in the atmosphere and oceans that are nearly horizontal. Over the past years, the numerical solution of multi-layer shallow water systems has been widely researched. In stratified geophysical flows, two-layer shallow water equations are proper models for the simulation of certain phenomena in the atmosphere and oceans. In this model, the fluid is assumed to be composed of two shallow layers of immiscible fluids in which the superposed layers differ in velocity and density in a two-dimensional domain. The constant density of upper layer is less than the density of the lower one. For the solution of shallow water equations, high order compact finite difference schemes have been widely used owing to their good accuracy compared with standard finite difference schemes for a large range of wave numbers and a low numerical diffusion with small dispersion errors. In this research, fourth-order compact finite-difference method was used for spatial differencing of f-plane two-layer shallow-water equations in the vorticity-divergence formulation for a rectangular domain with periodic boundaries; the results were compared to those of conventional second order finite difference method. For time integration, a three-level semi-implicit formulation was applied with the Robert-Asselin time filter which prevents the numerical instability caused by the computational mode of the three-time-level scheme. The equations were derived in terms of barotropic and baroclinic variables such that they were split into two coupled systems (barotropic and baroclinic systems) consisting of all variables of both upper and lower layers in each system. These systems are different than standard two-layer shallow water systems. A perturbed unstable zonal jet, in a two-layer shallow-water flow, was considered for initial value problem with baroclinic instabilities. The two-layer baroclinic initial values were extracted from a one-layer initial condition such that the potential vorticity of one-layer initial condition was equal to the upper layer potential vorticity; other initial values of the two-layer shallow water equations were determined by taking the definition of baroclinic initial condition, in the situation where the initial current in the upper layer is opposite to one in the lower layer such that the initial barotropic variables are all zero. Over time, the initial state broke up into smaller barotropic and baroclinic vortices. To control the numerical nonlinear instability due to the interaction of nonlinear terms of the vorticity equations and subsequently produce the aliasing errors, the barotropic and baroclinic planetary vorticities were explicitly damped by adding the hyperdiffusion operator acting on the same vorticity equations. There exist myriad methods for assessing the accuracy of numerical schemes such as the conservation of total mass and energy. The ability of each simulation to conserve the total energy on the total layer-depth (i.e. energy error) and mass between isolevels of the potential vorticity (i.e. mass error) within each layer, was measured in order to assess the numerical accuracy. Results showed that this model meets the conservation laws of mass and energy in the test problem considered here. The fourth-order compact finite-difference method entailed less energy error than the second order finite difference method during the time integration of two-layer shallow water equations; additionally, it is more accurate regarding the conservation of mass for a long time integration. قادر، س.، احمدی‌گیوی، ف. و گلشاهی، ح.، 1389، مقایسه عملکرد روش‌های اَبَرفشرده و فشرده ترکیبی مرتبه ششم در گسسته‌سازی مکانی مدل آب کم‌عمق دو لایه‌ای: نمایش امواج گرانی- لختی و راسبی خطی، مجله ژئوفیزیک ایران، 4(2)، 49-69. قادر، س.، احمدی‌گیوی، ف. و گلشاهی، ح.، 1391، حل عددی معادلات آب کم عمق با استفاده از روش فشرده ترکیبی مرتبه ششم، مجله ژئوفیزیک ایران، 6(4)، 35-49. قادر، س. و اصفهانیان، و.، 1385، حل معادلات آب کم‌عمق با استفاده از روش فشرده ترکیبی تعمیم یافته: دهمین کنفرانس دینامیک شاره‌ها، دانشگاه یزد، گروه مکانیک، 9 تا 11 آبان 1385. Blayo, E., 2000, Compact finite difference schemes for ocean models: 1.ocean waves: Journal of Copmutational Physics, 164, 241-257. Castro, M. J., Garcia-Rodriguez, J. A., Gonzalez-Vida, J. M., Macias, J., and Pares, C., 2004, Numerical simulation of two-layer shallow water flows through channels with irregular geometry: Journal of Copmutational Physics, 195, 202-235. Cotter, C. J., Frank, J., and Reich, S., 2004, Hamiltonian particle-mesh method for two-layer shallow-water equations subject to the rigid-lid approximation: SIAM Journal of Applied Dynamical Systems, 3(1), 69-83. Cushman-Roisin, B., and Beckers, J. M., 2009, Introduction to Geophysical Fluid Dynamics: Physical and Numerical Aspects: Academic Press. Cushman-Roisin, B., Esenkov, O. E., and Mathias, B. J., 2000, A particle-in-cell method for the solution of two-layer shallow-water equations: International Journal for Numerical Methods in Fluids,32, 515-543. Dritschel, D. G., Polvani, L. M., and Mohebalhojeh, A. R., 1999, The contour-advective semi-Lagrangian algorithm for the shallow water equations: Monthly Weather Review, 127, 1552-1565. Esfahanian, V., Ghader, S., and Mohebalhojeh, A. R., 2005, On the use of super compact scheme for spatial differencing in numerical models of the atmosphere: Quarterly Journal of the Royal Meteorological Society, 131, 2109-2130. Ghader, S., Mohebalhojeh, A. R., and Esfahanian, V., 2009, On the spectral convergence of the super compact finite-difference schemes for the f-plane shallow water equations: Monthly Weather Review, 137, 2393-2406. Ghader, S., Ghasemi, A., Banazadeh, M. R., and Mansoury, D., 2012, High-order compact scheme for Boussinesq equations: Implementation and numerical boundary condition issue: International Journal for Numerical Methods in Fluids, 69(3), 590-605. Ghader, S., and Nordström, J., 2015, High-order compact finite difference schemes for the vorticity-divergence representation of the spherical shallow water equations: International Journal for Numerical Methods in Fluids, 78, 709–738. Golshahy, H., Ghader, S., and Ahmadi-Givi, F., 2011, Accuracy assessment of the super compact and combined compact schemes for spatial differencing of a two-layer oceanic model: presentation of linear inertia-gravity and Rossby waves: Ocean Modelling, 37, 49–63. Hirsh, R. S., 1975, Higher order accurate difference solutions of fluid mechanics problems by a compact differencing technique: Journal of Copmutational Physics, 19, 90-109. JavanNezhad, R., Meshkatee, A. H., Ghader, S., and Ahmadi-Givi, F., 2016, High-order compact MacCormack scheme for two-dimensional compressible and non-hydrostatic equations of the atmosphere: Dynamics of Atmospheres and Oceans, 75, 102–117. Lele, S. k., 1992, Compact finite difference scheme with spectral-like resolution: Journal of Copmutational Physics, 103, 16-42. Matsuura, T., and Fujita, M., 2006, Two different aperiodic phases of wind-driven ocean circulation in a double-gyre, two-layer shallow-water model: Journal of Physical Oceanography, 36, 1265-1286. Randall, D. A., 1994, Geostrophic adjustment and the finite-difference shallow water equations: Monthly Weather Review, 122, 1371-1377.